If the image is clicked on in the browser, a tooltip with the image in its full size will open. Define the desired width and height of the image in pixels. 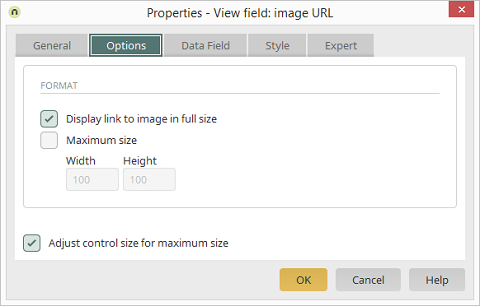 Means that when the size of the control is adjusted on the workspace, the current width and height will automatically be entered in the properties dialog. If this setting is not active, these values and the size of the control on the workspace will not be synchronized.